It was such a treat to visit Art Quilt Australia's 2017 exhibition last weekend. 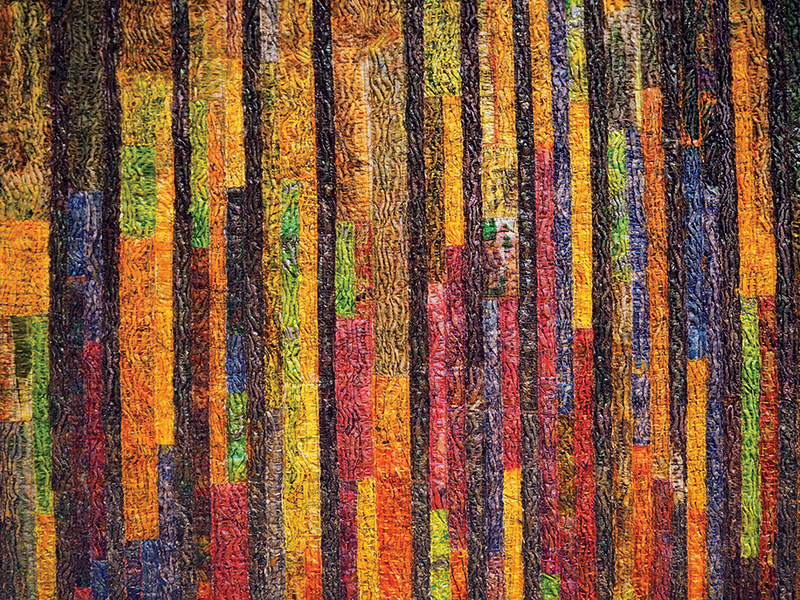 It's not often you see art quilts exhibited in Australia – certainly not a whole exhibition dedicated to them*. There was also a definite thrill in seeing my quilt hung amongst such spectacular pieces and I learnt a few lessons for next time, in terms of hanging and describing my work. The exhibition is on until October 22, so I thought I'd show you a few of my favourites – tempting those who are contemplating a visit, and sharing with those who can't. First are the quilts that immediately caught my eye from across the room – neither of which are done justice here – as it's their colours that are utterly striking. 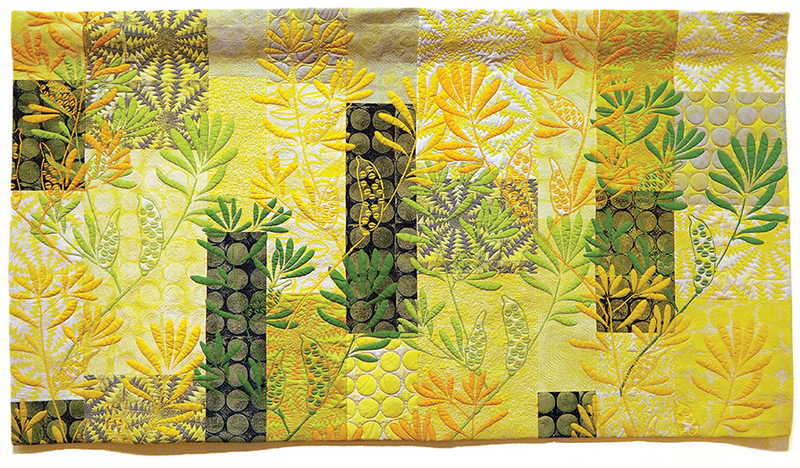 Susan Mathews' quilt is just so pine-lime-splice delicious! 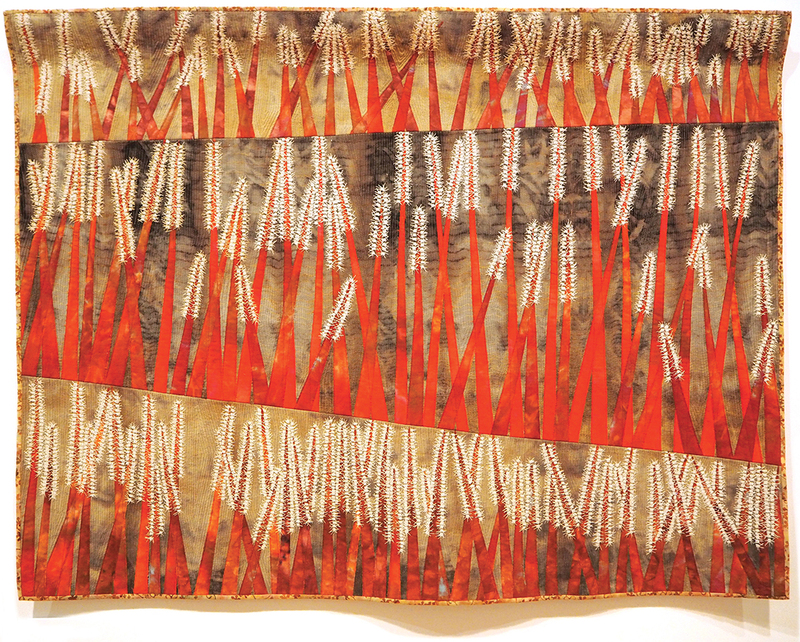 It includes the techniques of dyeing, lino printing, screen printing, machine piecing and quilting, and is part of a large, ongoing series she is doing on the subject matter. The next one that drew me in was Anna Brown's work – a piece reflecting the devastation of bushfire. It spoke to me with its charred and twisted shapes, some blackened and some ash white against that fearsome orange. The simplicity and irregularity of the hand quilting suited the natural subject matter perfectly. Then there were those quilts that I stood in front of for an age due to their techniques. Don't get me wrong, I loved the composition and use of colour as well, but the techniques really blew my mind. The first is by Sandra Champion. These were actually two large vertical panels hung side by side. Vertical doesn't work so well on a blog, and you'd miss what I'm trying to show you, so it's just a section pictured below. That fabulous texture is made by printing, painting and hand-stitching tissue paper – namely repurposed dressmakers patterns – onto silk, then manipulating and fusing it to make a paper textile. Depending on their colour, the strips looked like gnarled trees, moss-covered rock surfaces or flowing water – and if you look really closely you can still see the pattern wording and lines. The next one was Louise Wells' piece. Honestly, each of those little squares was an artwork in itself. The complete work is only 91cm (H) x 61cm (W), so that gives you some idea of the size of each of those squares. 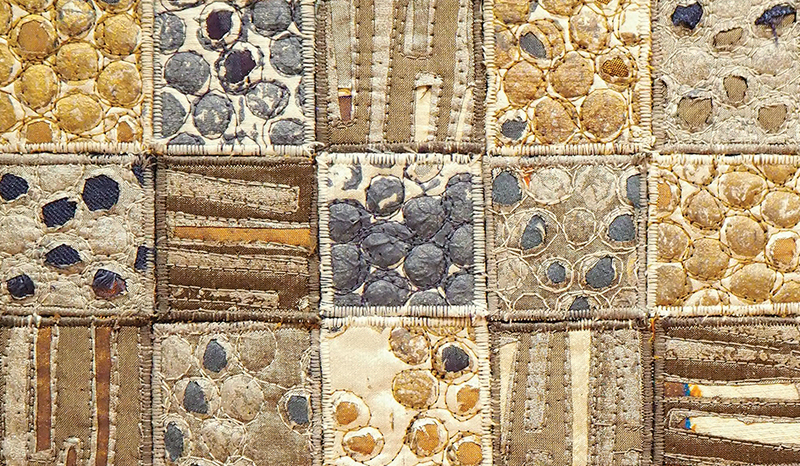 Below is the detail – created using a reverse appliqué technique on silk and polyester satins. I'm unsure, however, how each of the squares is attached to the next, or maybe they're just attached to the backing. The next quilt is here for its sheer cleverness. 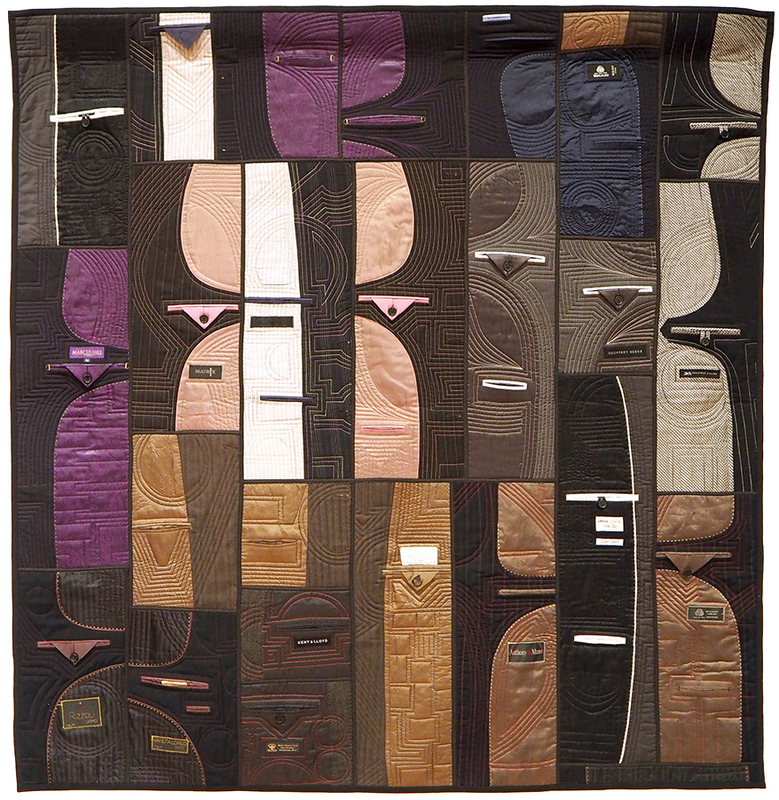 Looking like some Cubist masterpiece is Glad Howard's quilt made entirely from men's suit jackets, both their wool exteriors and silk linings. Part of what took my fancy with this piece was no doubt the use of repurposed clothing, but the way the jackets have been used – making the most of everything including pockets, button flaps and labels – the composition and the quilting that adds another dimension to the piece, really made this a standout for me. 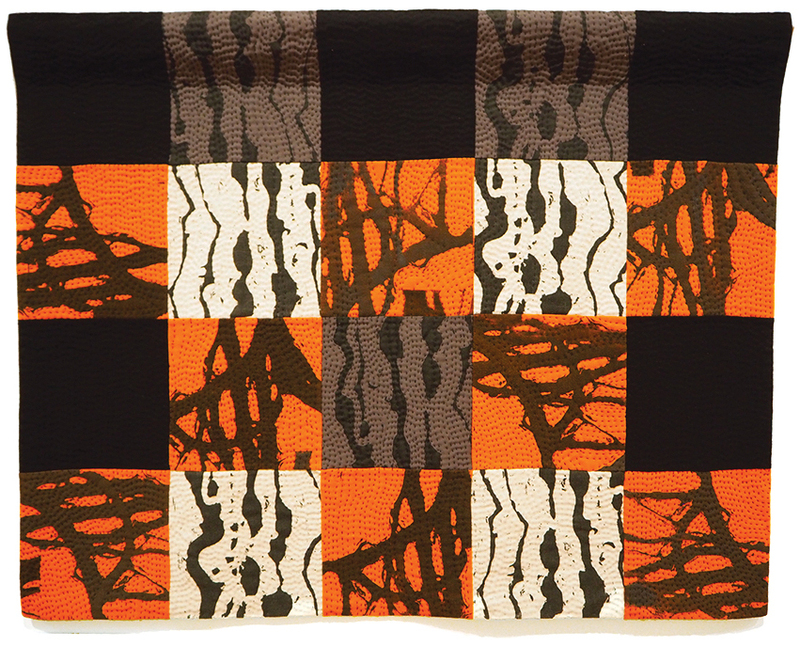 Last, but not least, is Carolyn Sullivan's quilt. 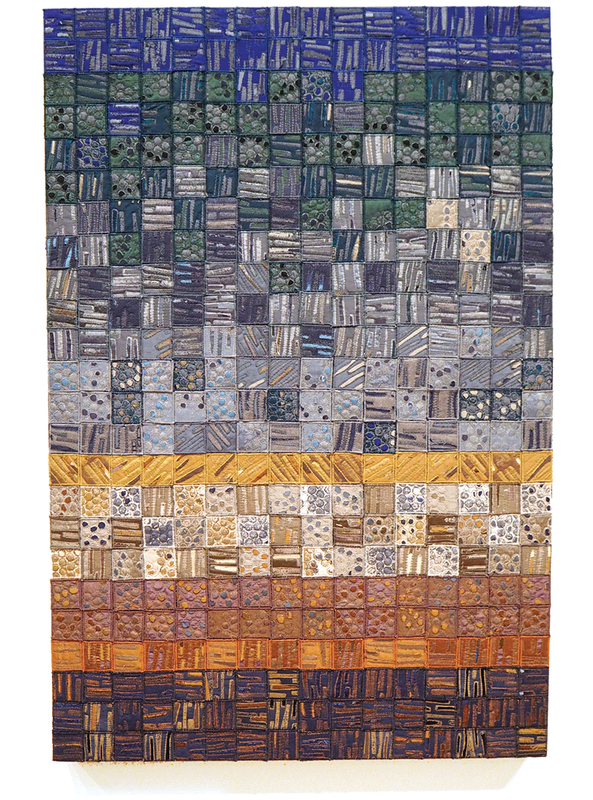 Carolyn had two pieces in the show and I have to say she is fast becoming my favourite Australian quilt artist. 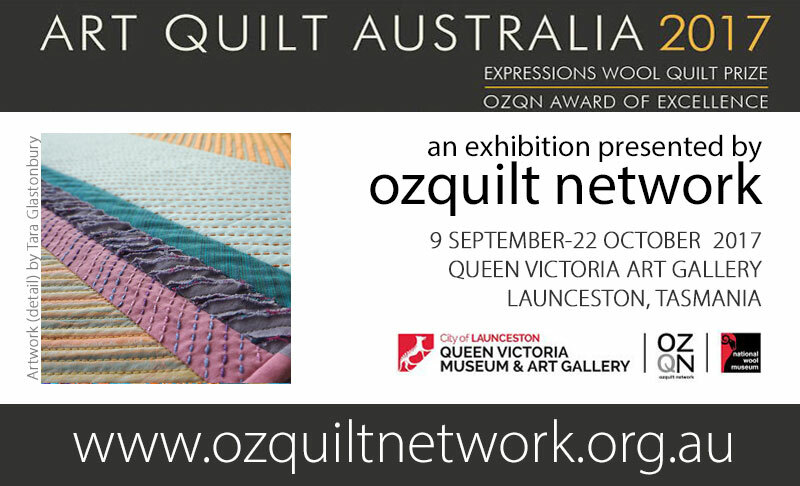 I really started paying attention when I saw her guest exhibition as part of the Sydney Quilt show earlier this year – a real highlight! It's her pieces that combine quilting with amazingly detailed hand stitching (as in the one pictured below) that I particularly love. They really showcase our unique landscape and flora creating a stitched language that is truly Australian. I hope you enjoyed this sneak peak of the show. I will post a couple more over on Instagram – more detail from these pieces and few extra faves, and there's a link here to the full exhibition. Don't forget to pop in if you find yourself in Launceston in the next few weeks! *It was such a shame then that 'Dare to Differ', the Quilt Guild of South Australia's contemporary quilt exhibition, also a biennial, was on at exactly the same time. C'mon organisers, get together and sort it out so us quilt lovers can exhibit in and see both next time! Thanks for that, Tara as I had no hope of seeing that exhibition. Those quilts look amazing. Some people are just so creative (and I count you among them). Congratulations on having your quilt hung with the best of them. Thanks Ma! I think I've got a ways to go on this journey but it was certainly wonderful to be up there.